There is not much worse than a seeing your lawn quickly damaged by grubs in the fall after all of the hard work spent on your lawn throughout the season. What makes it worse than anything, is that damage cannot be predicted or foreshadowed. The white grub larvae are not seen since they live below the soil and munch on your grass roots below the surface level, disconnecting the grass blades from their source of nutrition and killing them at the root! Grubs may be a problem one year and not the next, so the best way to prevent the headaches of grub damage is to treat your lawn with a preventative. Preventatives take about 1 month to systemically reach your grass roots and to be present for grubs to feed on. Because of the early start to spring this year, it is recommended to apply grub control anytime now through Mid-June for the Western PA region. 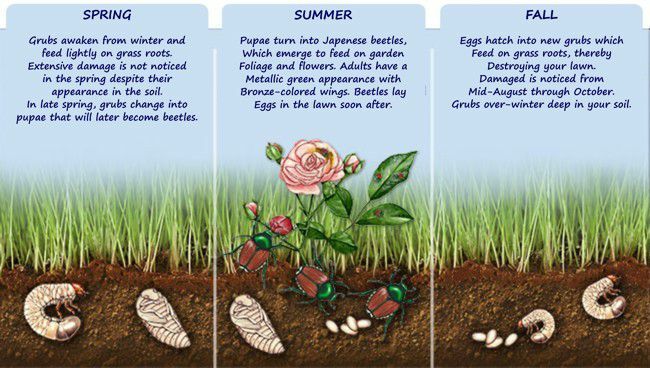 Please reference the image below to see the 12 month life-cycle of the Japanese beetle (the most popular white grub species in our region). Preventatives are made in the form of a chemical or an organic spore. Chemical treatments made by Scotts (Grub-Ex) or Jonathan Green (Grub and Insect Control) are broad-based and prevent/kill all common types of white grubs. Both of these treatments are granular and are applied with a lawn spreader. Once watered in and allowed to dry, these products are safe for kids and pets to play in the yard. These products are advertised as “season-long” but typically last only about 4 months, so it is important not to apply them too early in the season for effective control in the fall. If you prefer an organic option, you will want to consider St. Gabriel’s Milky Spore (available as either a granule or powder). This spore multiples by the thousands inside the grub and destroys Japanese beetle grubs. Despite its organic nature, the best thing about the Milky Spore is that it will continue to kill and prevent grubs for up to 10 years, when applied as directed. It is important to note that Milky Spore is only effective against Japanese beetle grubs. These are the most popular grubs found in our region, but there are other types of white grubs that can cause significant damage to your lawn (including northern masked chafer grubs, Asiatic garden beetles, European chafer, green June beetles, May and June beetles, and Oriental beetles). 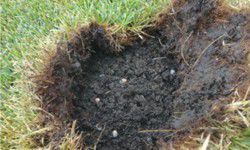 Regardless of the treatment, it is important to apply grub preventative to your entire lawn, since there is no guessing to where the eggs will be laid come fall. It is not necessary to treat garden areas, however, since grubs only enjoy the soft, tender roots of your grass! Be proactive and protect your lawn from grub damage with a grub control this spring or early summer.